A couple of years ago, former Dead Letter Dept. frontman Rob Moir performed in Exclaim! 's meeting room and played a then-unreleased song called "Lost and Found Like You." 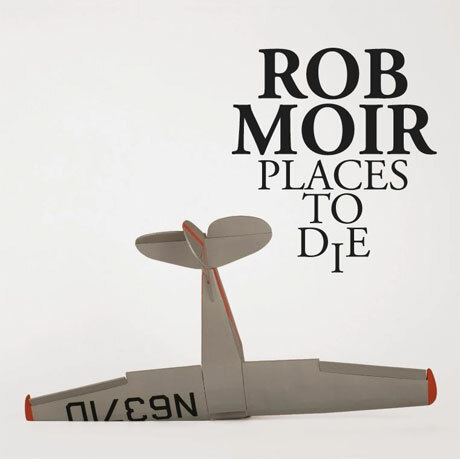 That tune will appear on the Toronto folk-punk's new album, Places to Die, due out April 30 through Underground Operations/Universal. These 10 songs were recorded with producer Lynne Dubuc in Toronto and London, ON. Interestingly, the model airplane on the album cover was built by Dallas Wehrle of Constantines. Sonic touchstones include Bruce Springsteen, Wilco and Elliott Smith, while a press release promises, "Easily at home in heavy subject matter, Rob routinely finesses clever turns of phrase in his lyrics. A simple guitar strum is infused with feeling when met wit his charming narratives." Scroll to the bottom of this page to watch a video for the fiery acoustic strummer "Places to Die (Before You See the World)," which was evidently filmed at a busy party. The tracklist is below, as is Moir's upcoming tour schedule. This includes a string of shows in Ontario and Quebec in April and May.